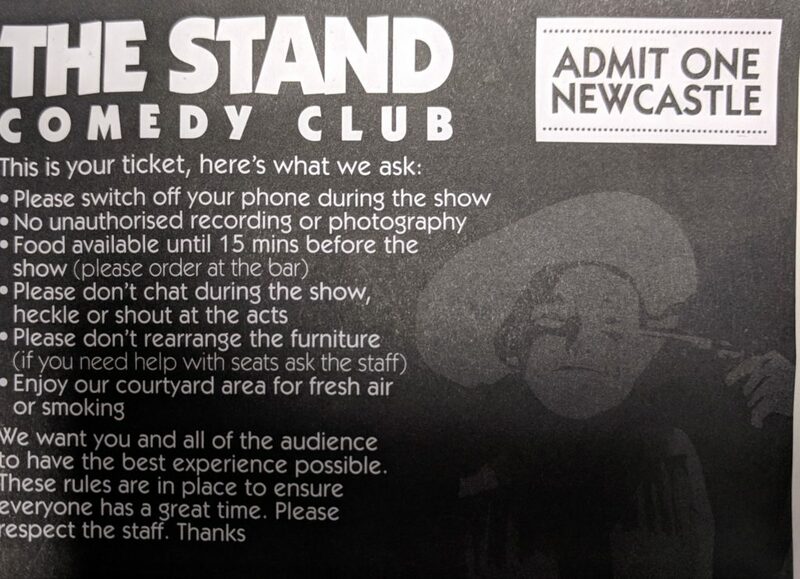 I don’t think I’ve ever been to a comedy club before and I certainly didn’t know there was one in Newcastle until the chance to buy the tickets for tonight came up a few months ago! Although I’ve been going to gigs for years I’d not really bothered going to see comedians until quite recently (although we did see Little Britain in Brighton) when we went to see Sarah Millican. 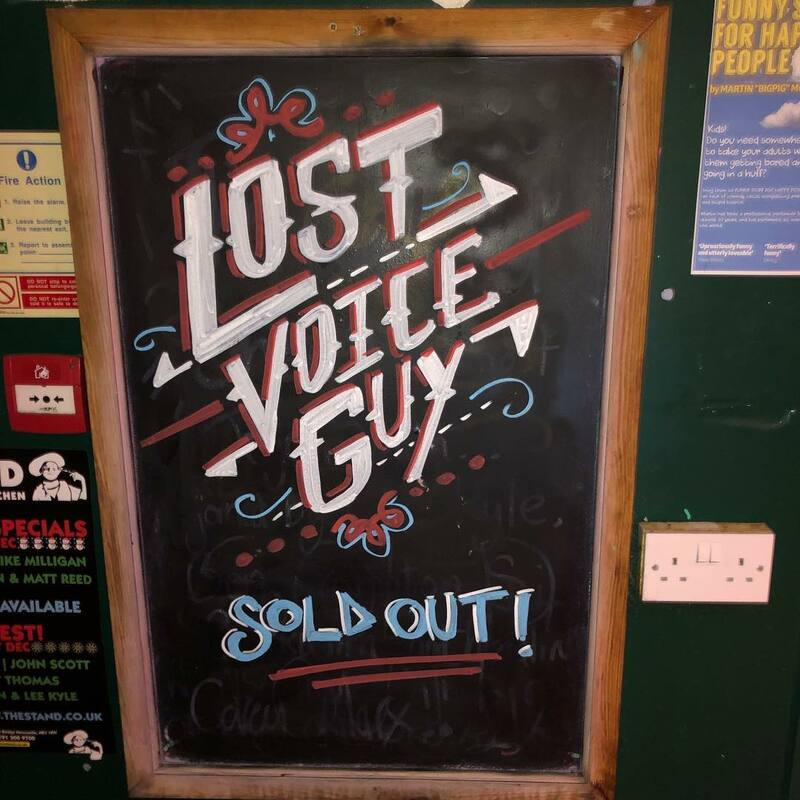 We’ve seen her twice now and really enjoyed it both times so I was quite looking forward to seeing Lost Voice Guy tonight – especially in such a small venue. Sarah had spotted the announcement about the gig not long after he’d won Britain’s got Talent and thankfully we bought the tickets straight away because it was sold out by the following morning! 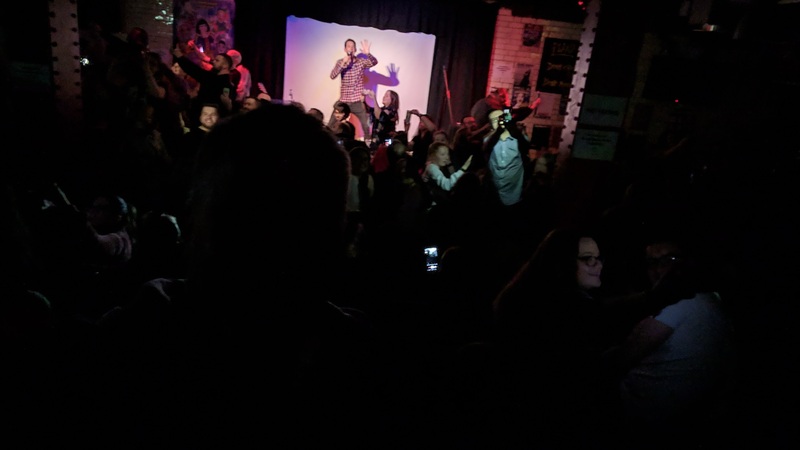 The venue was nice – it’s underneath what looks like a regular pub and is much bigger than you would expect from the outside. Having said that I’ve never seen so many rules and regulations – no talking during the act, no moving the furniture, no heckling, no photos or recording etc tec. When we went in the majority of seats were full except for a bench along what seemed to be the back wall which was empty. We checked it was ok to sit there, it was, and grabbed the best position and very soon others had joined us. I went off to the loo and as I came back they had opened the curtain behind us and now there were many more seats on a raised platform. I nipped in to grab some and as I indicated two to Sarah someone sat in them so we grabbed the two next to them. No sooner had we sat down than the tallest man in the world sat in front of us completely obscuring our view! We looked around and there were some tall stools behind us so we grabbed two of them – this meant we could see unhindered and that we were once again pretty much straight on to the stage! 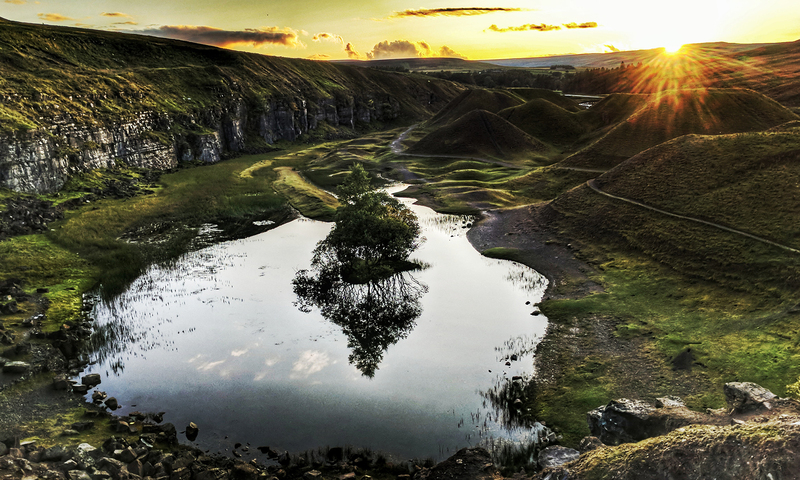 I went to get some drinks – I had a lovely pint of Porter – pretty much the pint I had had in mind when we went to the pub in Wolsingham a couple of weeks ago! As we were drinking it the support act, announced as the token able-bodied performer for the evening. came on. The guy, Jonny Awsum, was really good with lots of silly songs involving audience participation! He had people making noises, playing the triangle, singing along, waving our arms and mobile phone torches and taking selfies with him in it! 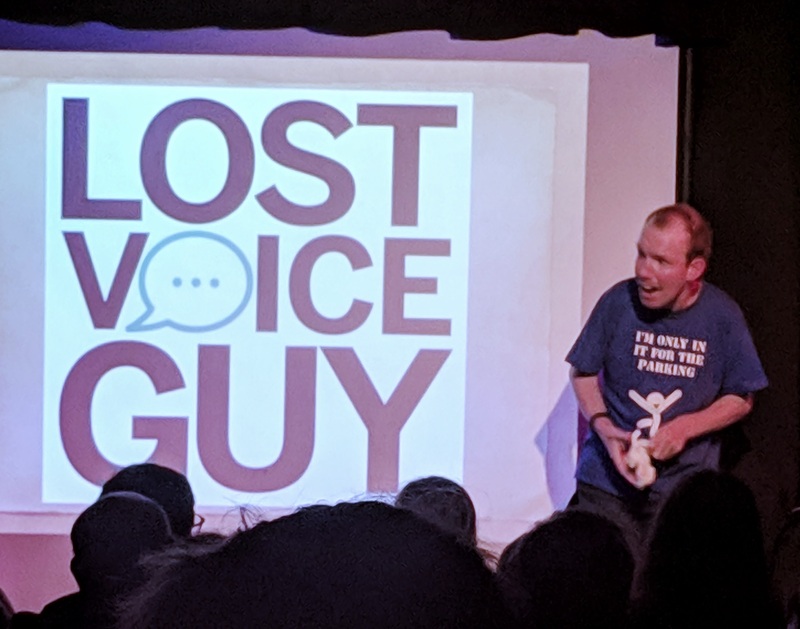 After an interval Lost Voice Guy himself came on – and he was as funny as I had remembered from his TV appearances. He was wearing his Only in it for the parking t-shirt and unlike when the was on BGT he spent most of the night sitting. A lot of the stuff he did was stuff that we’d already heard on the show but that didn’t make it any less funny! It did feel odd laughing at jokes about cerebral palsy with Sarah sitting next to me though! One of the things he did on the show was play questions from songs like Phats and Small – Hey what’s wrong with you and then answer them. 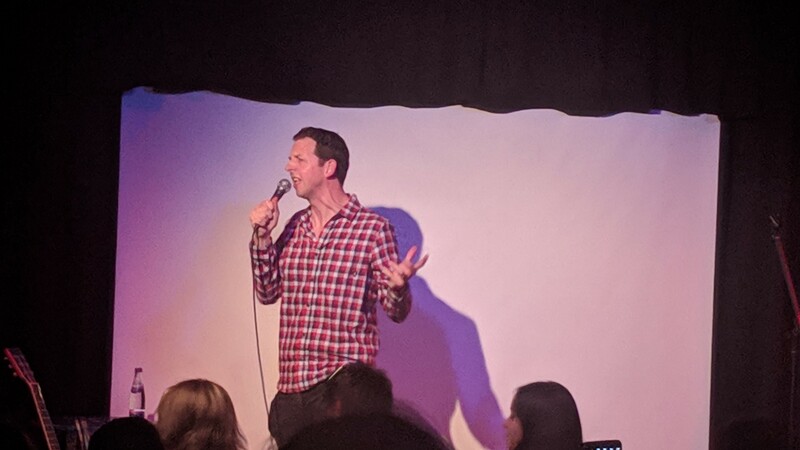 He expanded that tonight and played “War, huh, what is it good for?” and the answered Absolutely nothing in his computer voice! As we were leaving he was sat next to the merchandise stall posing for selfies with people. He really does come across as a really really nice bloke. I would like to see him again but I think it will be interesting to see how his act matures as he obviously can’t go on using the same material forever but for now I’m glad it’s all come together for him – he surely deserves it! 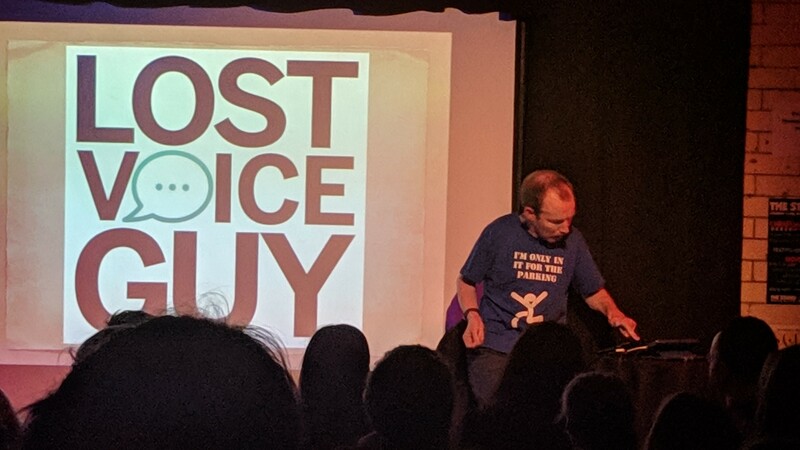 Sarah and I discussed how much we’d enjoyed the show and the venue in particular – there were several shows advertised that we would quite fancy going to so I think we might try and go there a bit more regularly! 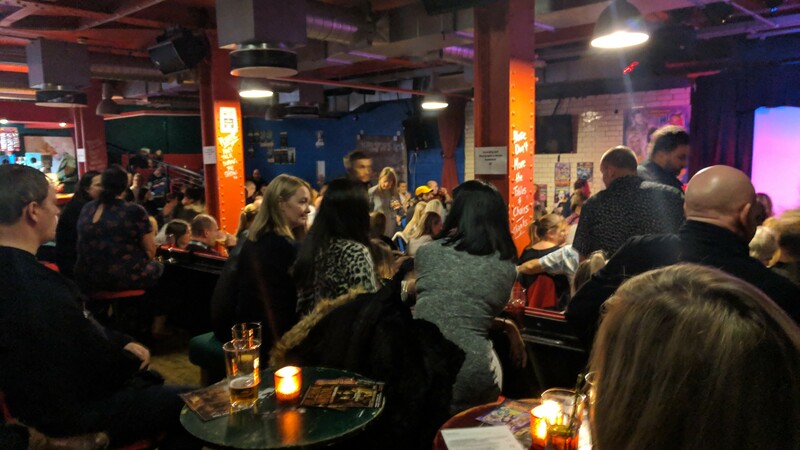 I did find out too late that I could probably have got them to reserve seats for us because (and I don’t know if there is usually as many seats are there are tonight) it’s usually a mixture of seating and standing. I guess we’ll see how it goes if we go again!